MSO Concert 3: Love, Death and "Great Terror"
We may all be emotional wrecks by the end of this concert! 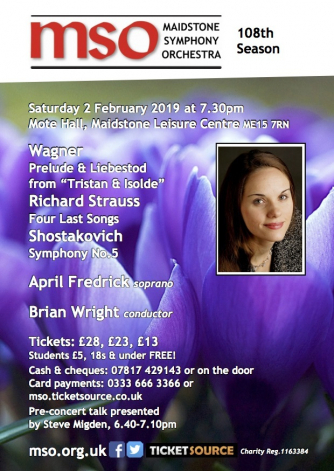 The acclaimed soprano, April Fredrick, sings Richard Strauss’s highly charged, yet beautifully poised, Four Last Songs. She also joins MSO in our glorious opener in which Wagner encapsulates the essence of his opera Tristan and Isolde. The 5th Symphony was the make-or-break work for Shostakovich. Written in 1937 in the midst of Stalin’s “Great Terror”, its dual sense of optimism and tragedy both placated diehards of the Soviet regime and gave comfort to the oppressed. Steve has been a professional musician and educator since arriving from the USA in 1965 to study horn at the Royal Academy of Music. He presents informative informal and 'fun' talks throughout Kent. He has served MSO as Principal Horn, MOS Chairman, and currently as an MOS Vice President.